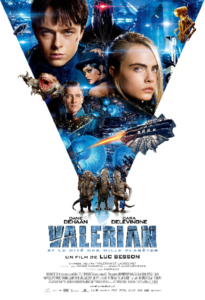 (78) While its score might make you imagine it mediocre, Valerian is a dizzying blend of towering peaks and abysmal valleys across the many arts that go into making a movie. Its gorgeous vistas, striking costumes, and wild lighting are undercut by poor pacing and expressionless acting. Valerian himself delivers his dialogue as if Batman were afraid of waking the baby. More than making you yearn for a sequel, Valerian makes a strong case for reading the source material.